The first thing that comes to mind when you think of the weather in the Philippines is humidity. Even during its ‘dry’ season, the Philippines is known for its tropical, humid climate with substantial rainfall. Sunscreen is imperative for you throughout the whole year no matter where you find yourself. 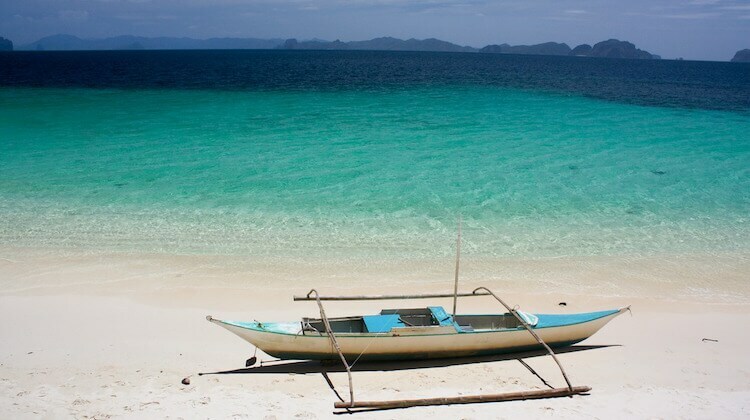 However, it is especially important if you plan to spend time in a tropical location like the Philippines. According to the Skin Cancer Foundation, short bursts of UV exposure in tropical settings can exacerbate your risk of skin cancer. When you spend time in the humid Philippines, you need to be sure that you protect your skin against the sun using all measures, especially constant wearing and reapplication of sunscreen. No need to worry. I will help you search for the right sunscreen for your skin for your time in the Philippines. After looking into everything needed for proper protection in the Philippines, SimplySunSafe recommends Raw Elements Eco Formula Sunscreen Stick SPF 30 as the best sunscreen for the Philippines. Keep reading ahead for a detailed buyer’s guide, comparison table, and in-depth reviews of the top 5 sunscreens for the Philippines. Anytime you decide to go searching for a sunscreen, no matter what the purpose is, you need to remember to look for broad spectrum protection. This means that you will receive balanced protection against both UVA and UVB rays. Yes, there are two types! They work differently, which is why they both need to be protected against. UVB rays are the ones that cause burning or tanning by damaging your outer layer of skin. UVA rays, on the other hand, damage your deepest layer of skin (the dermis) and cause premature aging. Neither type is good for you at elevated levels. Exposure to both types of rays increases your risk of skin cancer. The strength of the intermittent exposure to UV rays in the tropical Philippines makes you more vulnerable so you need to be sure that your sunscreen provides broad spectrum protection! If you’re anything like me then you’ve been basing your sunscreen decisions mainly on the Sun Protection Factor (SPF) rating throughout your whole life. But what does it really mean? Don’t worry, I didn’t know either! Once I understood how it worked, finding sunscreen became a lot easier. The SPF rating tells you what fraction of the sun’s UV rays will reach your skin, if, that it, you have properly applied your sunscreen. So before you do anything else, make sure you know how to rub your sunscreen in evenly! Let’s say you’re wearing a sunscreen with an SPF rating of 30, this means that only 1/30th of the sun’s rays will reach your skin. So you’re super protected, right? Well, yes and no. There are many factors that influence the effectiveness of SPF like time of day, amount of properly applied sunscreen, and even reflections from surfaces like water or sand! That’s a lot to think about, I know. Just keep in mind that wearing sunscreen with an SPF rating of 30 doesn’t mean you can stay in the sun 30 times longer than if you weren’t wearing sunscreen. Also, remember that SPF only protects against UVB rays! Surprised? I sure was. There is such a small difference between an SPF rating of 30 and one of 100. What does it really mean for choosing sunscreens, especially in a sunny, humid climate like the Philippines? The AAD recommends always choosing sunscreens with SPF ratings no lower than 30 and no higher than 50. SimplySunSafe stands behind this guideline and recommends sunscreens that fall within those brackets. The number one thing to remember in the Philippines is that you need to reapply your sunscreen at least every two hours regardless of what SPF rating you choose! It’s helpful to know that there are two main types of sunscreen — physical and chemical. ‘Does it really make any difference which type you use?’, you may be wondering. The truth is that is does, and those difference lie in the active ingredients and in the ways the sunscreens work to protect your skin. Chemical sunscreen absorbs UV rays as they reach your skin, while physical sunscreen reflects UV rays before they reach your skin. Now which would you prefer to use? This speaks for itself, I believe, but if you’re still not sure, listen to this. Chemical sunscreens often contain ingredients that mess with your hormones. I’m imagining you wouldn’t enjoy being in the Philippines and having some unexpected hormonal reaction! The worst of these ingredients is called oxybenzone and despite concerns from the FDA it’s still used in many popular sunscreens. Take care to avoid oxybenzone and use physical sunscreens in the Philippines! The number one aspect of the climate in the Philippines is the humidity. Even their ‘dry’ season is still humid. During your time there, you will find yourself sweating regularly, something you will adjust to. Just make sure that you remain protected against the sun’s UV rays while you’re adjusting. The way to do this is to choose water resistant sunscreens. With water resistance, you’ll be able to go out into the humidity of the Philippines without your sunscreen melting off right away. You will sweat, but you will know that you’re sunscreen is still working. Sunscreens are available with 40 or 80 minutes of resistance. Because of the high level of humidity daily in the Philippines, I strongly suggest that you choose and use sunscreens with 80 minutes of water resistance. Lather up and stay protected while you enjoy the Philippine’s beautiful scenery! So we’ve established that it’s humid in the Philippines. This means that when your water resistance starts to wear off, you will need to reapply your sunscreen immediately. Don’t be caught out in the tropical sun without proper protection. Stopping in the middle of your day to reapply sunscreen can feel like a burden. You need to spend time making sure that your lotion has rubbed in properly and evenly on your face and body. You can save yourself some time and the feeling of hassle by using sunscreens that are in stick form. With a sunscreen stick, applying and reapplying can be faster, easier, and smoother. You’ll be able to conveniently carry around a compact sunscreen stick for fast reapplication without taking up a lot of space in your things! The simple fact is that zinc oxide is the strongest active ingredient for protection, especially in a tropical and intense climate like the Philippines. It is safe and protects against the full range of UVA/B rays. You will make your life easier and gain peace of mind if you choose sunscreens that use zinc oxide as an active ingredient. Just keep in mind that zinc oxide tends to cause a bit of a white cast to be left on your skin. This means these products might not be the best sunscreen for Asian skin, though we do have a list for that too. You can plan ahead and bring some makeup to cover this cast, if you feel that it will bother you. After extensive research into sun care in the Philippines which included discussing issues with customers, reviewing customer feedback, examining manufacturer specifications, and participating in skincare forums, SimplySunSafe has managed to compile a list of the 5 best sunscreens for the Philippines. Each provides physical, broad spectrum protection with an SPF rating of 30 or greater. They are all water resistant with options in stick form! Raw Elements Eco Form Sunscreen Stick SPF 30 is an all-around reliable choice for sun protection in the Philippines. This compact stick provides a punch of broad spectrum protection with a very high concentration of desirable active ingredient zinc oxide (22.75%). Your skin will be well protected gently with Raw Elements, as the formula is hypoallergenic. It is unlikely to cause irritation even for the most sensitive of skin. With such a high concentration of zinc oxide, expect to be left with a bit of a white cast. You can use Raw Elements Sunscreen Stick all over your body and on your face as well. It’s mild and natural formula makes it safe for all members of your family, including children. Raw Elements provides the 80 minutes of water resistance that you really need in the humid Philippines climate. You can’t go wrong using Raw Elements Eco Form Sunscreen Stick SPF 30. 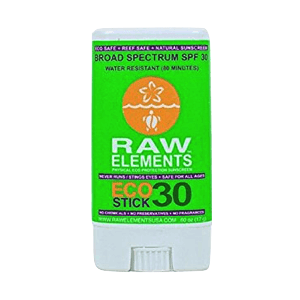 Get Raw Elements Eco Formula Stick Now! This is SimplySunSafe’s choice for the best sunscreen for your face in the Philippines. 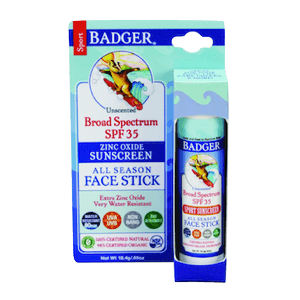 The highly reliable brand Badger provides you with broad spectrum protection with their face stick with a high concentration of active ingredient zinc oxide (20.5%). Badger is known for its simple and gentle formulas and this face stick is no different. You will feel safe knowing that when you apply this stick on your face and neck area, you will not end up with any irritation or discomfort. Prepare yourself ahead of time for a white cast on your face so that you won’t feel surprised or disappointed. With 80 minutes of water resistant protection, your time in the Philippines will be enjoyable. You will be able to carry your sunscreen stick anywhere you please, even in your pocket, as it is very compact! Get Badger Face Stick Now! 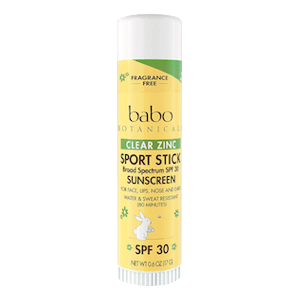 Babo Botanicals Clear ZInc Sport Stick SPF 30 is another convenient yet effective sunscreen option for your time in the Philippines. With Babo Botanicals, your broad spectrum protection is taken care of with a high concentration of active ingredient zinc oxide (20%). Babo Botanicals boasts a mild formula that is safe for use on all skin types without worrying about irritating reactions. It is a good option for daily use on your face and neck area. Another helpful thing about Babo Botanicals is that it works well under makeup which you may appreciate, if you want to cover the slight white cast it leaves. With 80 minutes of water resistance and a small, compact stick for convenient carrying, your time in the Philippines will be sun safe. Get Babo Botanicals Sport Stick Now! 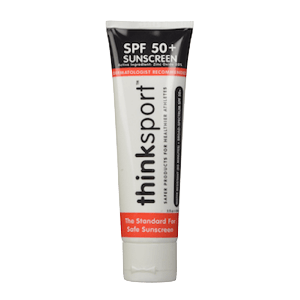 Thinksport Sunscreen SPF 50+ is one of SimplySunSafe’s most popular sunscreens because it provides effective and safe protection. Broad spectrum protection is covered with a high concentration of active ingredient zinc oxide (20%). Safety is unrivaled with thinksport, as it was the first sunscreen to pass the Whole Foods premium care requirements. It’s gentle enough for use on the face and body of all skin types, daily and without irritation. Of course, you will find yourself looking a bit white, but it just means you’re well protected. Thinksport provides a durable 80 minutes of water resistance to combat the humidity in the Philippines. It is a great option if you prefer the lotion form of sunscreen. Thinksport also has a higher SPF rating which may be helpful if you have paler or particularly sensitive skin. Thinksport considers your whole family and has specific formulas for kids and babies for optimal protection. As a little sidenote, this sunscreen was also chosen as the best travel sunscreen, so you know it’s quality pick. 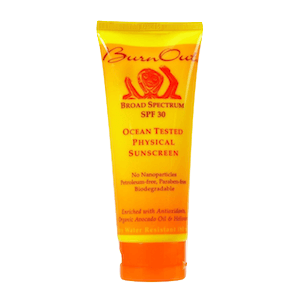 SimplySunSafe’s final recommendation for sunscreen in the Philippines is BurnOut Ocean Tested Physical Sunscreen SPF 30. This sunscreen provides you with broad spectrum protection through its high concentration of zinc oxide (20%). Its name may sound tough and it is effective, but BurnOut is gentle on all types of skin. Other than a slight white cast, you won’t notice any reactions such as irritation on your skin. You can use this sunscreen all over your body and your face and neck area, as well. With 80 minutes of water resistance, you are safe and protected in the humidity of the Philippines. Another lotion sunscreen option if you prefer, BurnOut will keep your skin covered with you enjoy yourself in the tropical Philippines. Get BurnOut Ocean Tested Now! You’ve read this guide that was written for those seeking the best sunscreen for the Philippines. Hopefully, you’ve gained greater knowledge about what protection is needed and have found the right product for you. 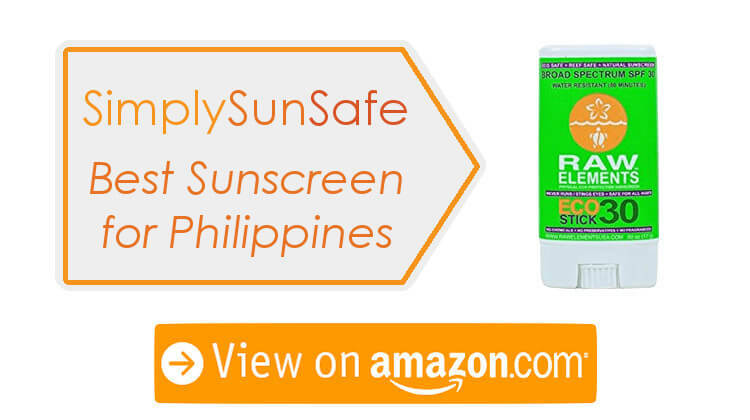 SimplySunSafe recommends Raw Elements Eco Formula Sunscreen Stick SPF 30, but all 5 recommended products will protect you well in the humidity of the Philippines. Before you step out into the heat of the Philippines, it is best if you test out a few different sunscreens. You want to see how your skin will react with different formulas so that you can find the product that works best with your skin. Testing different sunscreens will give you much needed insight before making your final decision. I love learning new things and hearing about different products from the people around me! If you use or know of another great sunscreen for the Philippines, go ahead and share it in the comments. I will check it out and it might even make the list! Hi, I'm Meg :) I started SimplySunSafe to learn about sun safety and use this info to help my family and friends. Sun safety is an important part of everyone's life, so please use these articles to better protect yourself and your loved ones.